Even if there were fruits and berries a-plenty, ripe for picking and baking, I'd still want to serve chocolate. Always. There were a few cakes with ombre on the inside that look delicious but I knew there was a perfect berry cake a-coming so I wanted something that would be ombre-on-the-outside. I was inspired by this color-block chocolate. And yes, I tried to find edible flowers to go with the whole floral baking thing I was into. 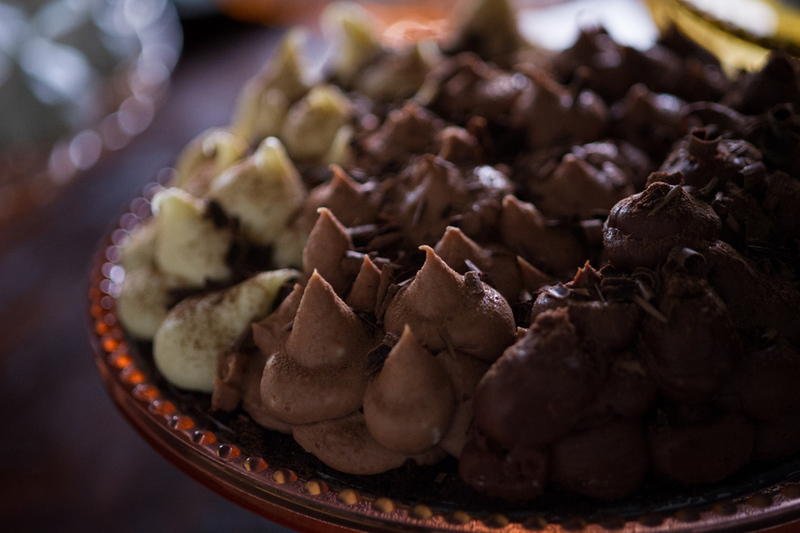 I've made variations on chocolate bark a bazillion times, including our first winter shindig. I thought this was an easy peasy slam dunk. Nope. The first round of ombre chocolate I used real white chocolate and gel food coloring. I could.not.get.it.to.set. So into the fridge it went. If you google putting chocolate in the fridge the first posts are about how to do it and the following posts are why you shouldn't do it. The next round I tried again with white chocolate and my new fancy powder colors. Nope. Still wouldn't set. So I opted for candy melts. So not all-natural and good for you but goodness, do those suckers melt well! I used the Ina Gartner method of melting in which you melt about 3/4 in a bowl in a microwave stirring every 30 seconds and when it's good and melty, dump in the remaining 1/4 and stir. 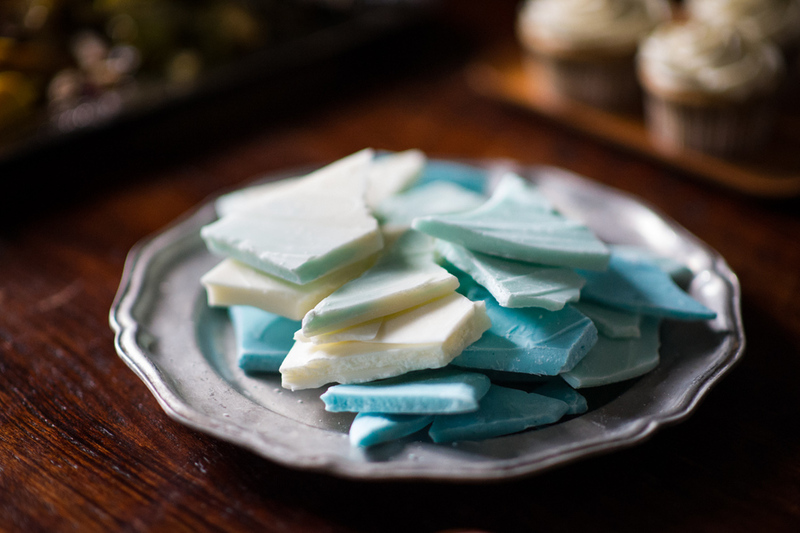 To get the ombre with the candy melts, I used gel food coloring. I got the darker color I wanted first and then added less dye for the progressive batches. In hindsight, I could've made a ton less (no one is going to eat a brick of chocolate, even me) and done it all in one batch adding color, pouring some to cool, adding a dash more color, etc. Sugar et al's Ombre Triple Chocolate Cheesecake has been haunting me on Pinterest. HAUNTING ME. I have been a bit too ambitious in the past and put this as a "maybe I'll pull it off" on the menu. But, c'mon. I wasn't not going to try it. Best case I serve a cheesecake. Worst case I have gobs of chocolate around to snack on. So, I tried. It is an easy recipe but give yourself plenty of time to execute it correctly. I gave myself enough time to finish it and skid into Sunday Dinner Club on time-ish. This was only my second effort piping. It's a lot of piping! I won't lie, the dark chocolate seized up as I was piping and it is mainly through aggressive dusting of cocoa powder and chocolate shavings but more Kelly's incredible photography that it looks even close to the recipe. Still, it is at the end of the day a triple chocolate cheesecake and even at it's most meh it's still pretty damn spectacular. I also don't know why mine turned out darker than Sonali's. All the more reason to try it again. And again. And again. Up next time: Ombre powdered donuts including an awesome gluten free recipe. Want more? Baking with floral notes.